When a city is a draw for new entrants, it indicates that that city’s economy is strong, and that word is spreading. If there are pronounced outflows, the opposite may be true. Given that the three housing markets getting a lot of attention these days are Vancouver, Toronto and Calgary we set out to look at whether people were entering or exiting those cities (or, more accurately, those census metropolitan areas, which encompass much of the suburbs around them). The overriding trend we found was that whatever the economic conditions, people chose to migrate into them – and there is reason to believe that they will in future as well. There are three kinds of ‘migration’ into any given city – from other parts of the province (intra-provincial), from other parts of the country (inter-provincial), and from other countries (immigration). In all cases we looked at ‘net’ figures. 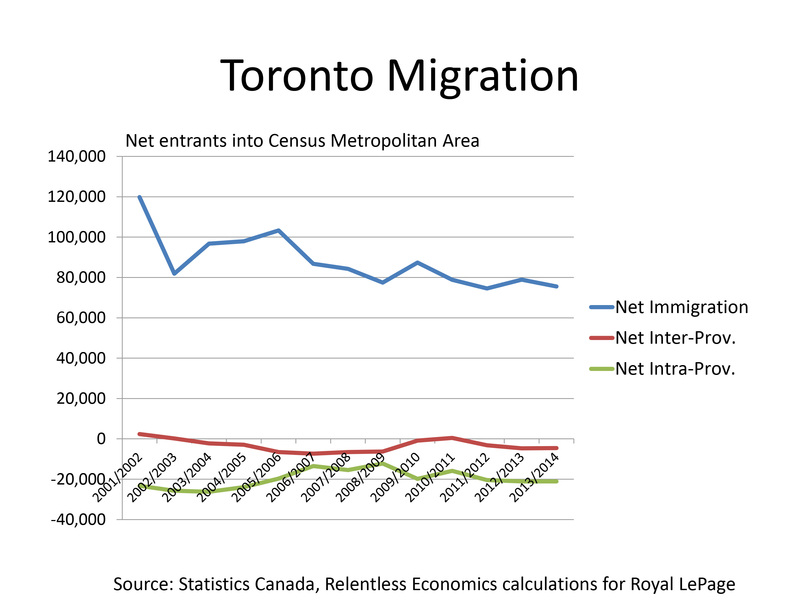 For example, when we talk about net intra-provincial migration into Toronto, we are talking about the difference between those entering the city and those leaving it for other parts of Ontario. Our data comes from Statistics Canada and is for the period from 2001/02 through to 2013/14 (data for 2014/15 will be released later this year). Immigration is the biggest population driver in Toronto. In fact, there has been an inflow of people into the city in the order of 619,000 over the past ten years, and on net all were new to Canada. Looking at the five years ending in 2013/2014, almost 13,000 more people exited the city to go to another province than came in from other provinces, and a net 98,000 more people left for elsewhere in Ontario. (The latter statistic is a sign of expanding job opportunities outside of Toronto. Hamilton, Ontario, for example, saw positive net in-migration from elsewhere in the province during the same time period that Toronto was seeing outflows). Net growth from immigration, however, was over 395,000 for the five-year period, suggesting that those coming from other countries are continuing to pick Toronto as the place they want to live. The story for Vancouver is similar to that for Toronto. Over the past decade, about 280,000 people on net have come into the city. Until 2012, people were entering from other provinces, but the relatively strong job opportunities in the other western provinces seems to have halted that trend. Approximately 1,400 people on net left Vancouver for other provinces over the past five years, and a further 14,000 on net left for other parts of the province. Net immigration though, added close to 143,000 people to Vancouver’s population over the period. This data supports the view that large numbers of people are indeed moving into the Lower Mainland each year and eventually buying homes, in contrast to the pop-culture view that the market is being driven by speculators. The most dramatic migration patterns are seen in Calgary, and the results bode well for the Calgary housing market. Unlike Vancouver and Toronto, Calgary has drawn population into the city steadily over the past decade, both from elsewhere in Alberta and from elsewhere in Canada. Looking at Alberta migration only, there were a few years – from 2005/06 to 2008/09 – when the number of people coming to Calgary from other parts of the province went into negative territory during a soft period for energy sector head office hiring. On net, however, the number of people entering Calgary from other provinces only turned negative once over the past decade, in 2009/10. What we are seeing to this point in the current cycle is that despite a weakened energy sector, many more people are moving into Calgary from other parts of Canada than are leaving. The most dramatic boost to Calgary’s population has come from immigration, with annual net immigration doubling over the past decade. In the past, Calgary wasn’t ‘on the radar’ when immigrants were considering where in the world they would take their skills and capital. The city’s vibrant economy is a secret no more. To be sure, we may see lower annual growth over the next couple of years as the energy sector works through its current over-supply issues. But, the strength over the decade is also an indicator that Calgary has increased its domestic and international reputation as an excellent place to live and work. With its increasingly broadly based economy, future population growth does not look in danger. Population inflows do not correlate immediately with higher demand for housing. Indeed, given that it is often young adults that move, the rental market often gets a boost initially, with significant demand for homes following a few years later. But, the figures tell the story: Canada’s largest cities are increasing their economic power and their populations as well; trends that bode well for their housing markets. Data is for the period from July 1, 2013 to June 30, 2014. Reblogged this on Teresamardon's Blog.